And today we have the 7th sketch published, it's created by Tancha. I had a lovely opportunity to make a layout for the blog, my first one ever published, so I'm very excited. It's a beginning of my new project. An 8" by 8" (20 cm by 20 cm) album devoted to the "time of expectation". So I started from the very beginning: month #1. The photos are framed with satin ribbon, embellished with seed beads and set in place with brads. As a background I used two types of paper: deep purple textured foiled paper by Rayher and green paper with white flocked flowers by Creative Imaginations. It feels really cool to touch! Purple paper is also used for the title alphas - cut manually. 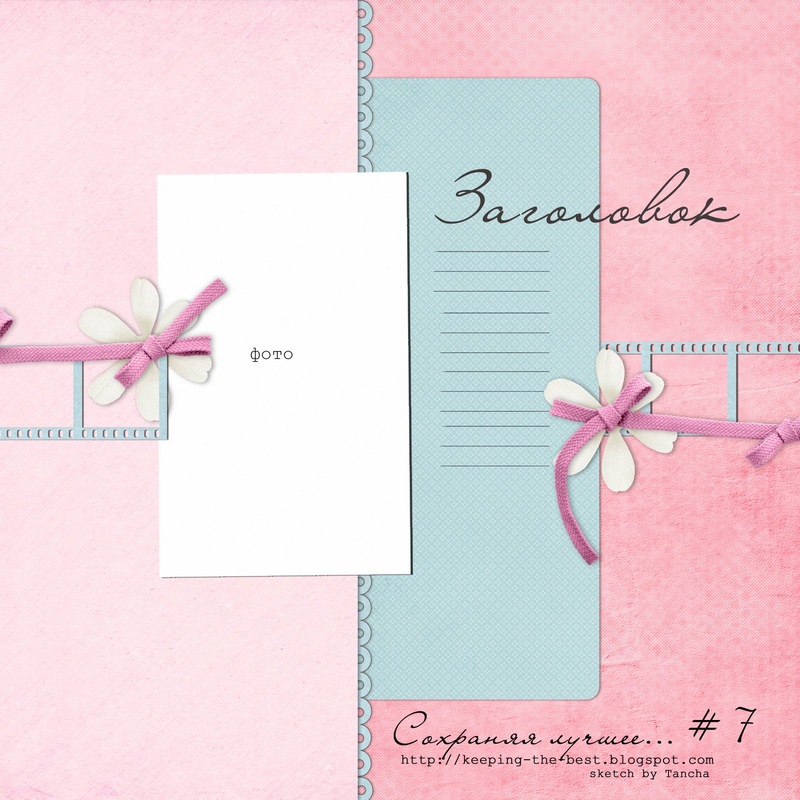 The journaling consist of two parts: a part of calender and some words, they say: "Let the life begin! We don't suspect anything and lead our normal life. Exactly on the 14th of Jan I signed up the fitness club membership and trained hard three times a week; had a night out with my girlfriend with a glass of Chili wine. And meanwhile wonderful and magical changes are happening in our life..."
I also used sticker flowers (bought at Accessorize store - sometimes they have pretty cute stickers! ), stamen (Pastila, thanks! ), one quilled fringed flower and a few brads. So, that's my debut. Thanks for looking! Аленчик, ооочень понравилась страничка, с таким чудесным смыслом :)) Поздравляю! очень красивый и трогательный разворот! Поздравляю с дебютом! Аленка! Это самое замечательное время - время ожидания чуда!!! Оно растет в тебе! Замечательная трогательная страничка! Я свои ожидания вспомнила - как летала от счастья (и чуть не долеталась-упала на огромный живот и сломала зуб))). Пусть у тебя все будет замечательно!!! !